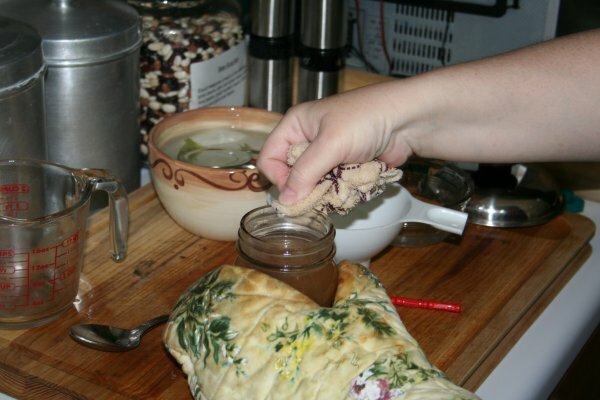 Canning and Preserving « Super Mom – No Cape! 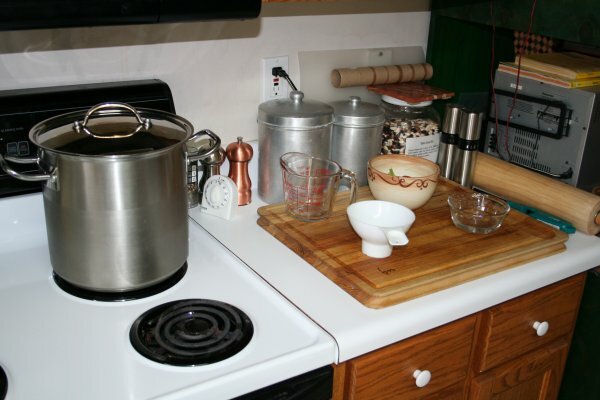 Tuesday, I described how we make our own homemade stock. 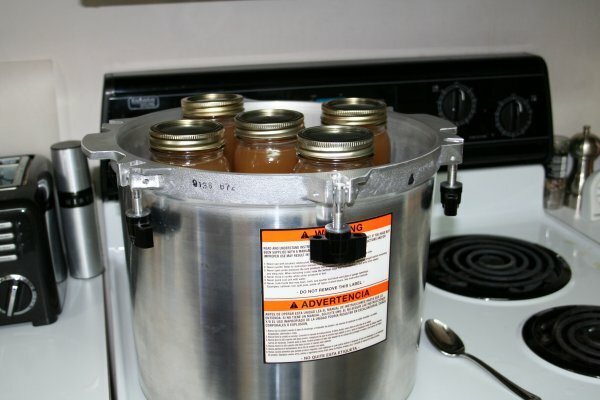 Today, I’m going to show you how we preserve that stock for future use by pressure canning it. A note before we get started: Despite what our grandmothers may have done or the canning methods they may have used, modern canning methods require all low acid foods such as those containing meat and vegetables to be pressure canned. Home canned food is perfectly safe to eat, if the proper canning procedures are followed. 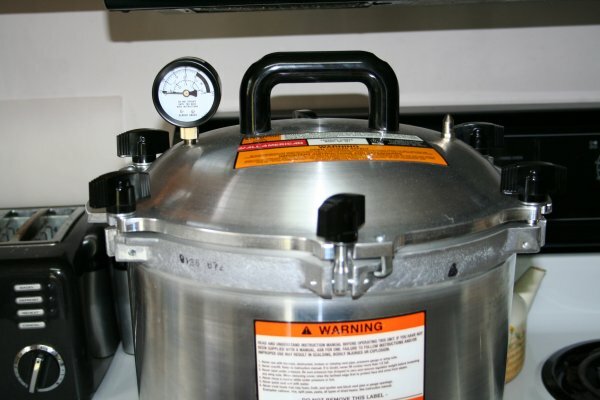 As a second note: When I first started pressure canning I heard all sorts of stories from people saying that they were too scared to pressure can because Grandma or Great Aunt or whoever had a pressure canner explode on them. 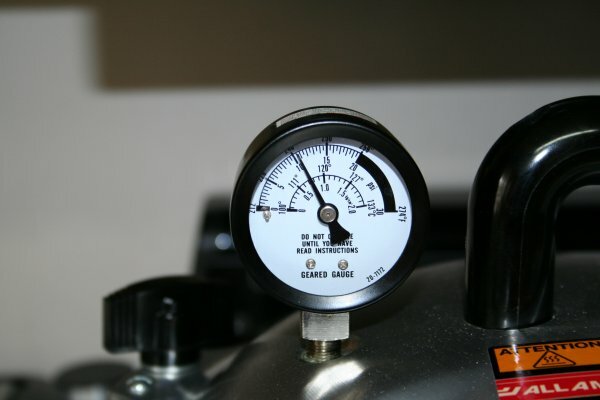 Today’s modern pressure canners have safety features that prevent that from ever happening. 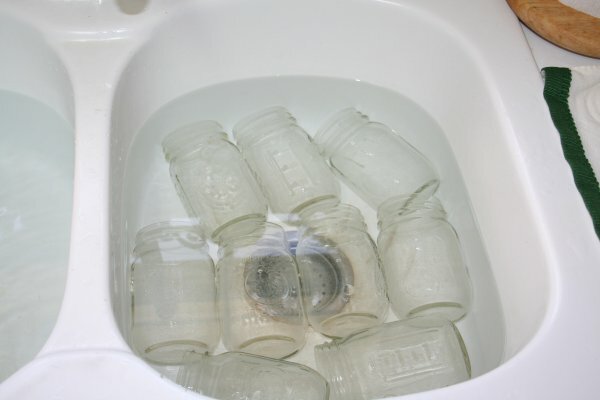 Wash the jars in hot, soapy water. Rinse thoroughly. And then place in a sink filled with hot water. 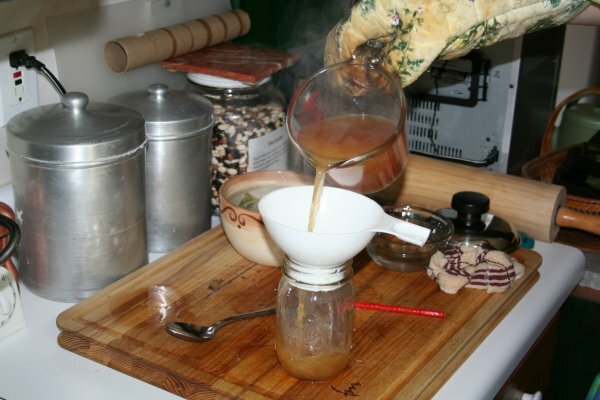 Keeping the jars in hot water helps to prevent thermal shock when filling the jars. Place your stock on the burner and bring it back up to a gentle boil. 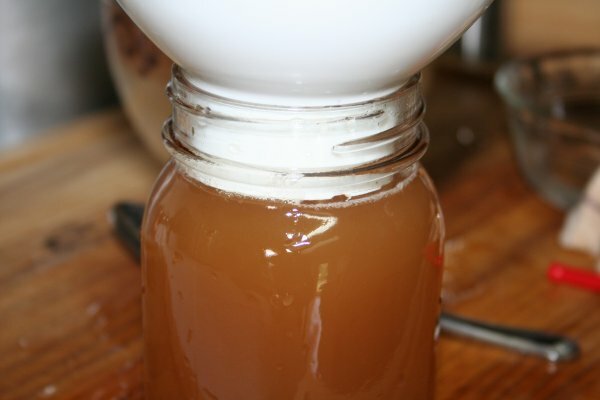 You don’t want or need a hard boil as that can cause your stock to get cloudy. It would still be perfectly fine to eat, it just wouldn’t look as pretty. While the stock is heating, get the canning station ready with measuring cup, canning funnel, bowl of vinegar and a bowl with canning lids. I always put in a few more lids than I think I’ll need. 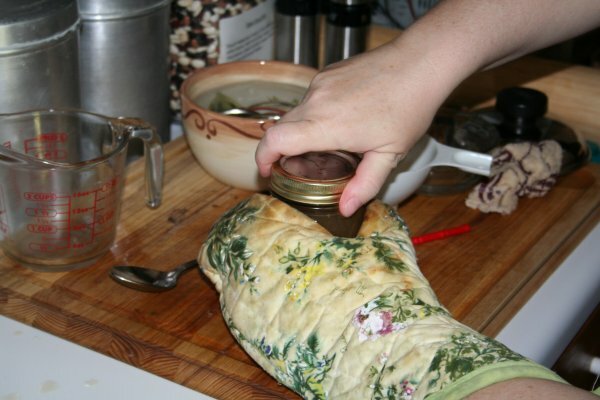 Pour boiling water over the canning lids and allow to sit for at least 7 to 10 minutes to soften the rubber on the lids. Once the stock has come to a boil, it’s time to start filling jars. Fill the jars leaving 1 inch head space. The great thing about using a canning funnel is that the funnel sits in the jar such that if you fill the jar to the bottom of the funnel, you have your one inch head space; no guess work or measuring involved. Wipe the rims of the jars with a cloth dipped in vinegar. Wiping the rim ensures that there will be a clean surface for the rubber of the lid to seal against. The vinegar cuts through any fat that may be in the stock. Add lids and tighten finger tight. Our canner holds 18 pint jars stacked in a double layer with a second rack between the layers. Once the canner is full or you’ve run out of stock to fill jars with; put the lid on the canner. Adjust the knobs so that the lid sits evenly. Allow the canner to vent for 7 minutes. Begin timing once you see a steady stream of steam coming out of the vent. I found it impossible to get a clear picture of the steam venting, but trust me, steam is coming out of the vent on the right. After the seven minutes is up, place the weight over the vent. For our altitude, we use 10 lbs pressure. 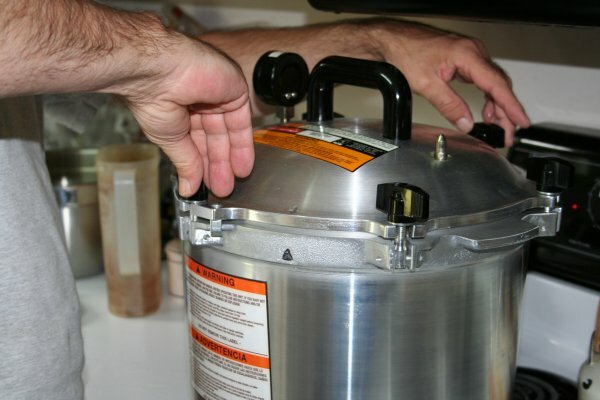 Be sure to check the manual for your canner to determine what weight is needed for your altitude. Slowly bring the canner up to pressure. You'll see that the gauge on my pressure canner reads 11 lbs. This is a factory setting and is correct for my canner. 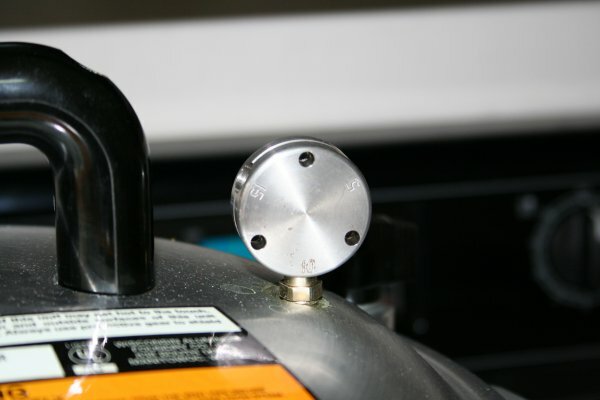 It’s tempting to turn the burner up to bring the canner up to pressure faster, but I’ve learned through experience that lower and slower is better and requires less adjusting of temperature once the correct pressure is reached. Begin timing when the weight starts to jiggle. Pints take 20 minutes, quarts take 25. The weight should jiggle one to four times per minute. If it’s jiggling more frequently or constantly, gradually adjust the burner temperature downwards. After the timer goes off, turn off the burner and allow the pressure to fall on its own. Do NOT move the canner during this cooling process. 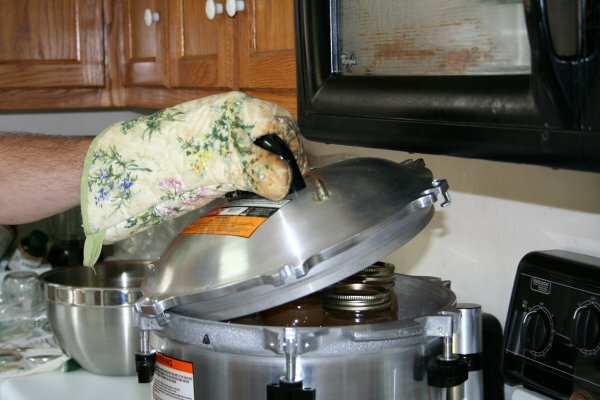 Once the pressure gauge reaches zero, remove the weight from the vent wearing an oven mitt. Undo the knobs, turn the lid and lift off. Always remove the lid with the lid facing away from you; that steam is super hot and you don’t want to get burned. 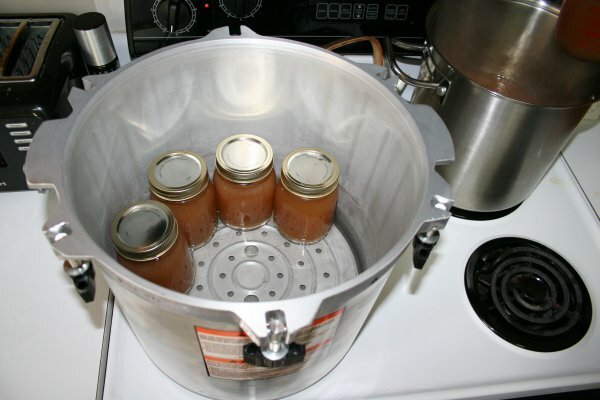 Remove the jars from the canner and place on a towel to cool. I love hearing the pinging sound as each jar seals. 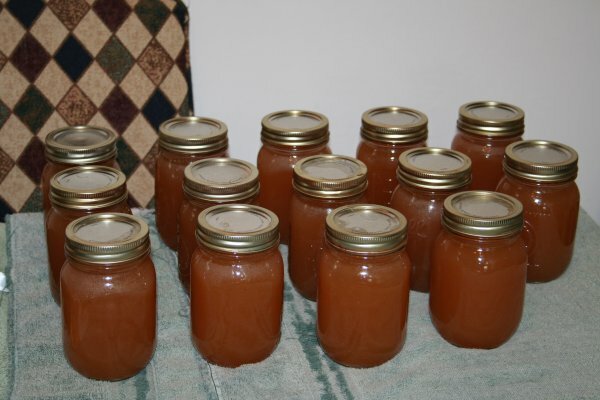 Allow the jars of stock to cool overnight. The next day, I check to make sure that all the jars have sealed properly. In the center of each lid there is a tiny “button” that during the sealing process is sucked down. If you push on that button and it moves up and down, the jars have not sealed. Then I unscrew the lids, wash the jars with warm, soapy water and allow them to dry completely before labelling with the contents and date. I keep six jars in a cupboard in the kitchen and the rest are stored in a dark, cool closet in the spare bedroom that Dave has added extra shelves to for storing all our home canned foods. Are you getting tired of the canning posts? I hope not because there’s more to come over the next little while. Today, I’m going to share two lessons I learned from this past weekend. Saturday morning, I decided I needed to get out of the house and away from home for a bit, so we drove over to the Collinsville Trade Day, in Collinsville, AL. It’s a huge flea market that you could spend all day walking around and still not see everything. But the main thing we go there for are the fruits and vegetables. It was on the way home from the Trade Day that we came across Mr. Farmer selling corn from the back of his truck (see my last post.) I usually spend time asking about where and how things are grown but the farmer volunteered the information before I even asked and we chatted more as he counted out our corn. I wish I had taken the time to do that with the vendors selling peaches at the Trade Day. The hand written sign on the booth said Home Grown Peaches. We were given samples to try and the peaches were lovely and sweet. Large baskets were priced at $4 each. I selected five of what I thought were the best looking baskets and paid for them. As we were about to transfer the peaches from the baskets (baskets are for display only) to the cloth bags we always carry with us, the vendor asked if we’d prefer a box for them. He brought out a box with Southern Peaches printed on the top and sides. It was then I realized that these peaches might not be home grown after all. But I’d already paid for them so it was too late to ask the questions I should have asked instead of trusting to the hand written sign. Sure enough this morning when I was washing them before peeling, some of them had stickers on them. They were locally grown, but not necessarily by the people who were selling them. Lesson #1 is a lesson re-learned. Always talk to the vendors and ask questions about where and how the produce is grown. Now for the second lesson of the weekend; as you already know, we also bought corn on Saturday. Corn needs to be processed the same day it’s picked or purchased because the sugars start to break down soon after harvesting. So the corn got frozen and canned. This meant that the peaches had to wait. I wasn’t concerned about the delay because I’ve bought peaches before and then waited a day or two to can them without a problem. But when I opened the box this morning, several peaches had already started to mold. Three were completely rotten and another 10 or so we had to trim away bad spots. Lesson #2… when buying peaches in the South plan to process them the day we buy them or find room for them in the fridge. 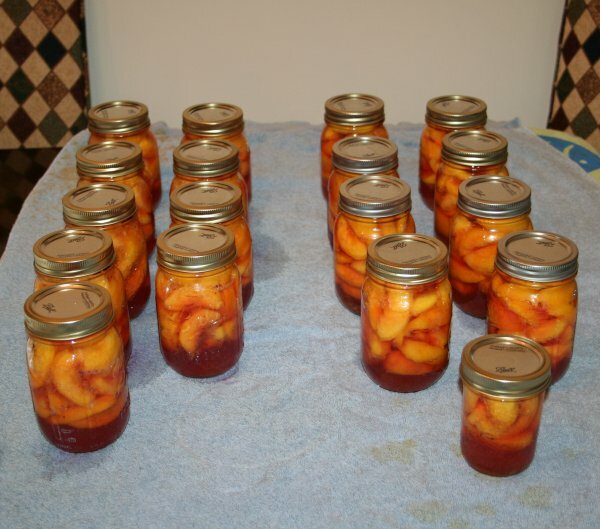 17 pints and 1 half pint (isn't it cute) of canned peaches. I asked for 6 dozen. He and his wife were most pleased to be able to go home early and get out of the heat. 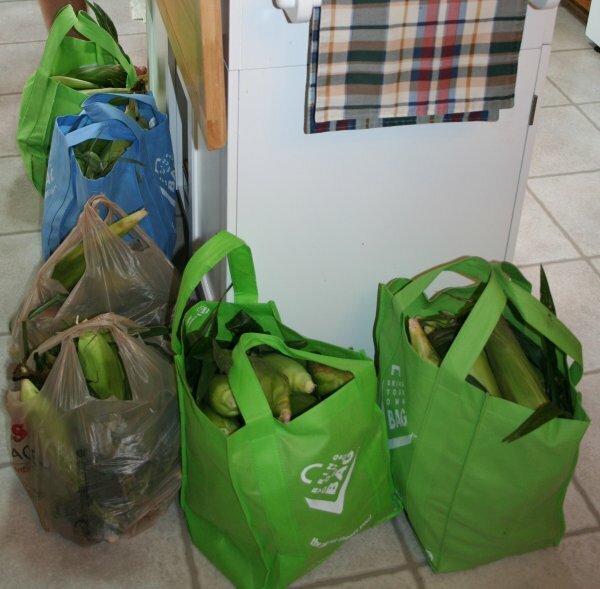 And I was just as pleased to come home with locally grown, organic corn. Here are 4 dozen blanched, drained and in the process of being bagged before being popped into the deep freeze. This year, we decided to make 12 bags of three and 12 bags of one to give us options depending how many are home for supper. If we need more than one package of three but less than 2 packages, we can open a single. We used a Foodsaver Vacuum Sealer but I can’t honestly give it a good recommendation. We’ve only had this vacuum sealer for a little over a year. It seals fine when all we’re doing is dry stuff like when I make up packages of dehydrated vegetables or packages of mixed dried bean soup. But any time we’ve tried to seal bags where the contents have even the least little bit of moisture, we have trouble getting the bags to seal properly. Yesterday, Dave ended up having to put the bags through at least twice, sometimes three times before he got a good seal. 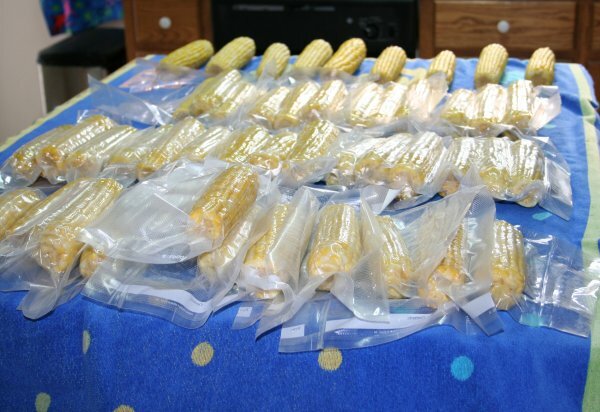 And the unit overheats and needs to be allowed to cool down after only a few seals… so bagging the corn actually took longer than the blanching did. We spent the evening shucking, washing and then cutting kernels off the rest of the cobs to can whole kernel corn. That took an hour or so longer than we expected and it was 11 o’clock before we got our first canner load of raw packed corn started. It takes 55 minutes to pressure can pints of corn not including the venting time, bringing it up to pressure and then back down to zero pressure after the 55 minutes are up. In case you’re wondering why I raw packed the corn last night and chose to hot pack it this afternoon… after spending a night in the fridge the corn was really cold and to then pour boiling water over the cold corn in jars, we could have had problems with jar breakage due to thermal shock. Hot packing the corn into hot jars eliminated that risk. 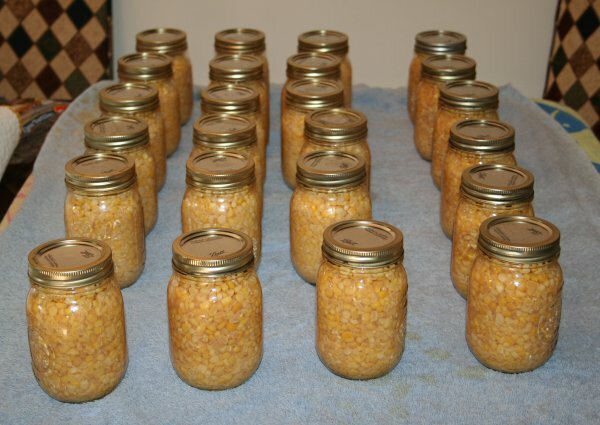 Between last night and today's canning we ended up with 24 pints of whole kernel corn. 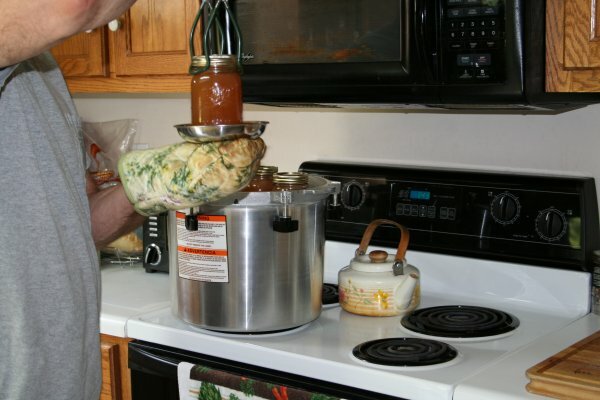 There are lots of other resources available on-line, but be careful that whatever resource you use practices modern safe canning procedures and when pressure canning it is wise to always check any on-line resource against the instructions provided in your owner’s manual to make sure to have the correct canning times.